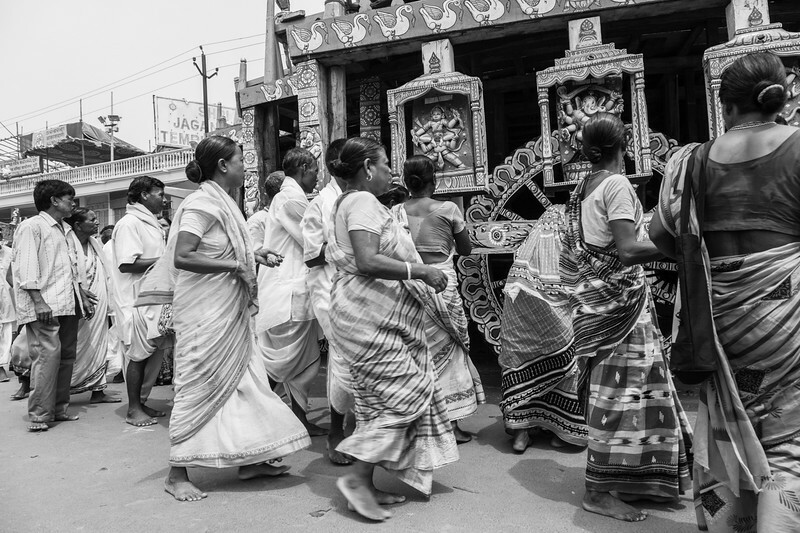 Once a year, in the Orissan coastal town of Puri, three residents of the Jagannath Temple, the deities Lord Jagannath, Lord Balabhadra and their sister Subhadra, leave their dwelling to travel two miles through the town, to visit the Temple of their Aunt, Gundicha Mata. 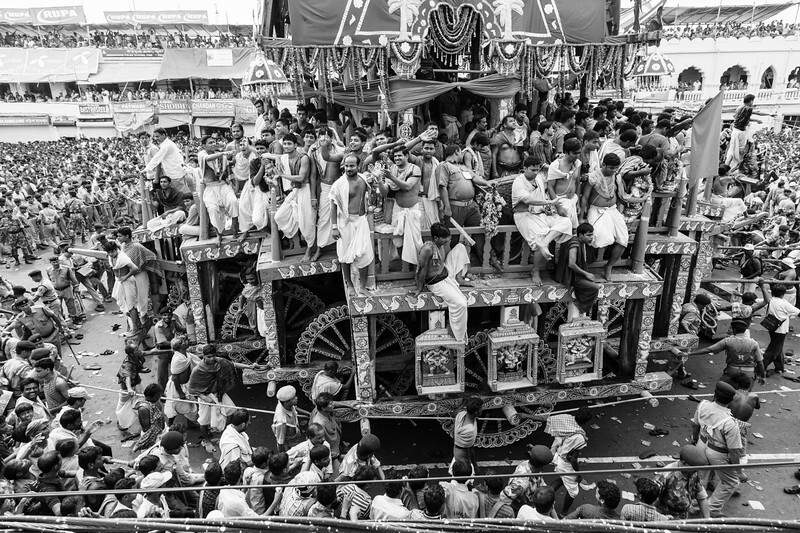 The deities travel in three highly decorated chariots, which are specially prepared each year for the event by a dedicated team of local carpenters. 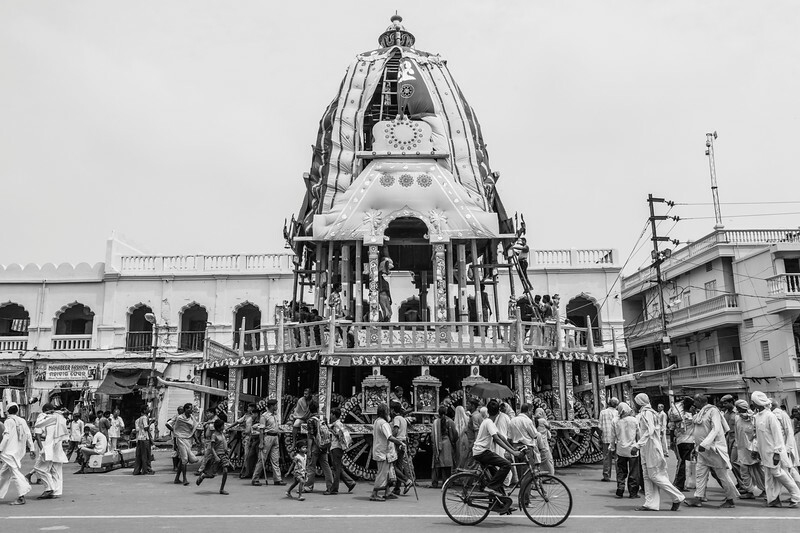 These preparations continue to the eve of the Rath Yatra and the completion of the 14 metre high chariots (built to resemble temples) happens simultaneously with the arrival of pilgrims seeking blessings from touching the structures. 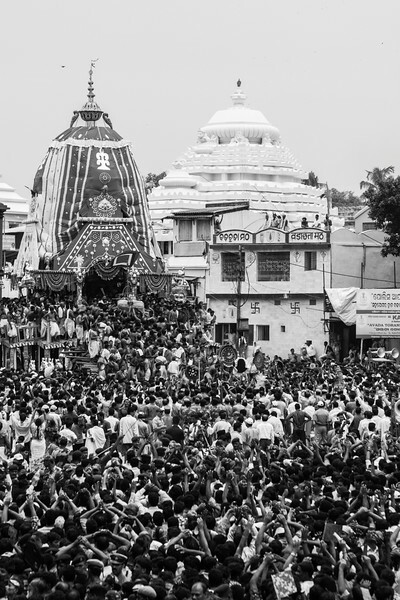 On the day of the Rath Yatra itself, the crowds start to assemble at dawn. 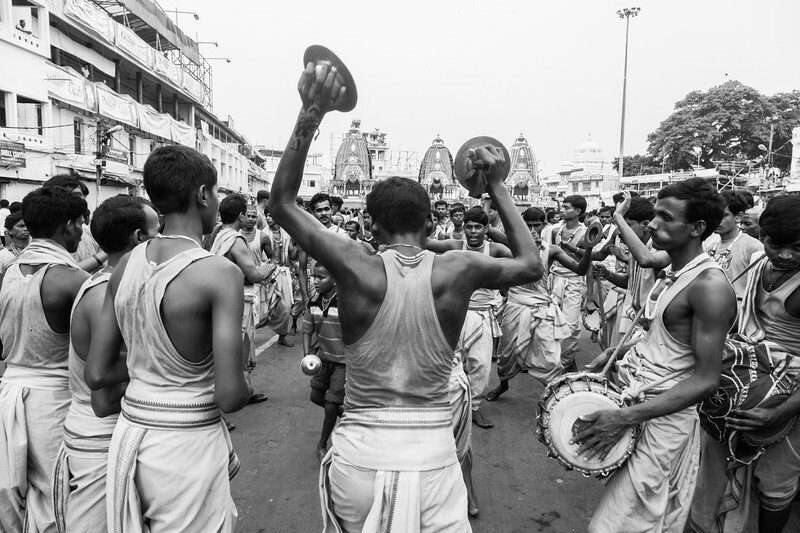 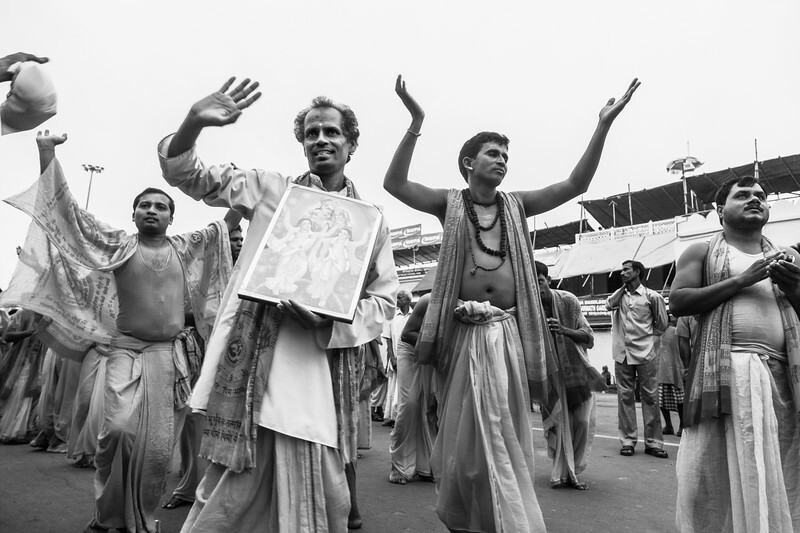 First to arrive are the Hare Krishna devotees (Lord Jagannath is an incarnation of Vishnu, as is Krishna) who sing and dance in front of the chariots. 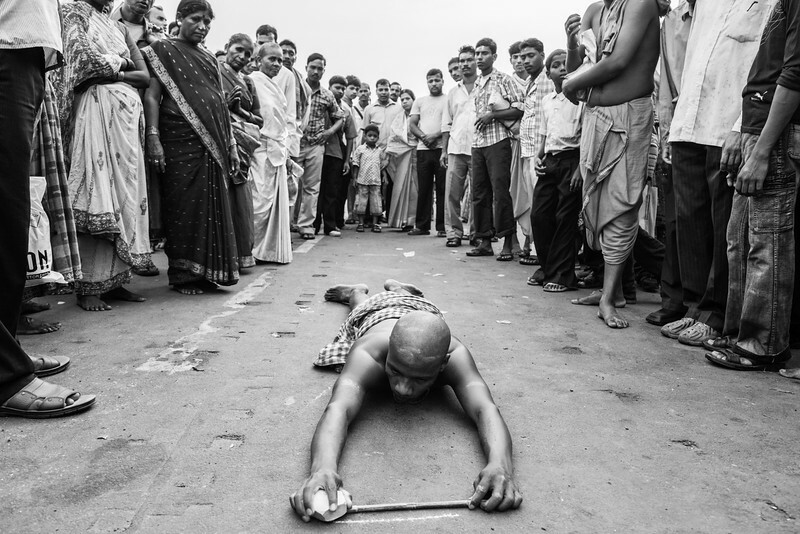 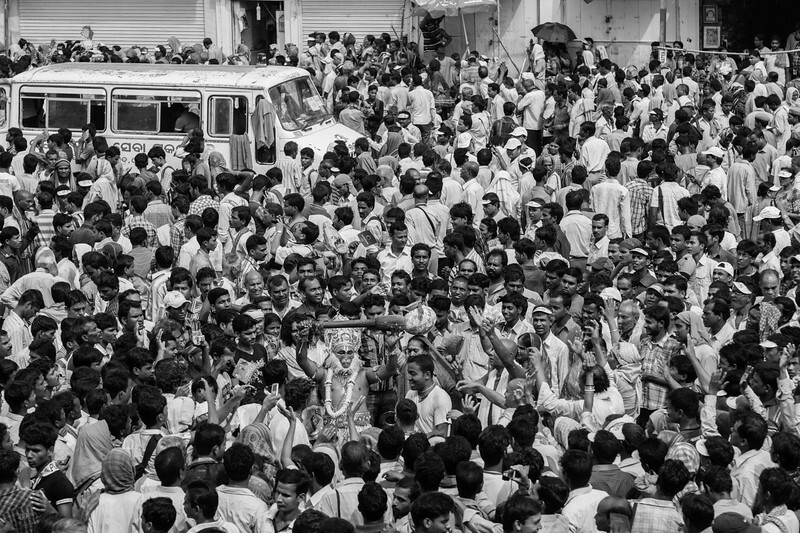 Many other pilgrims arrive, including sadhus, devotees who impersonate the many Hindu deities and those who prostrate themselves in front of the chariots. 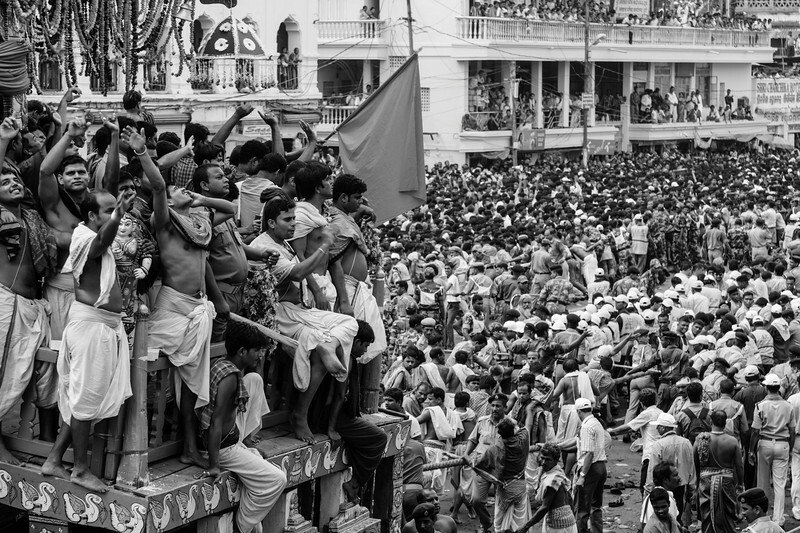 Eventually millions of people will line Grant Road, along which the chariots will travel. 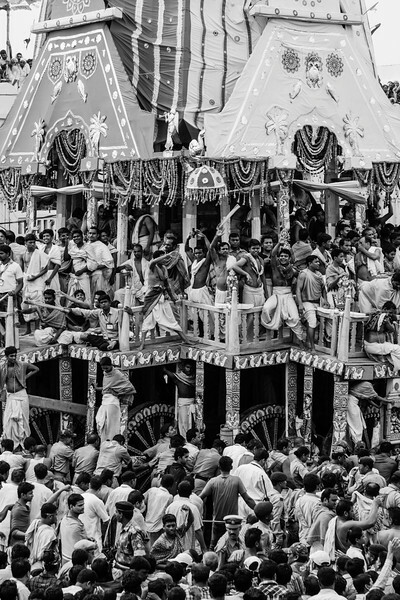 The chariots are pulled by hand as the crowds cheer. 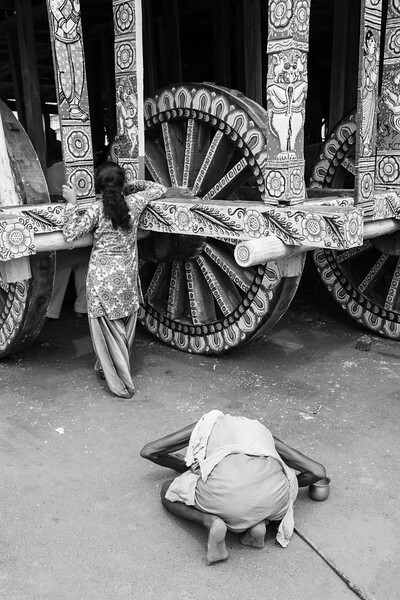 To catch a glimpse of the deities in their chariots is considered auspicious, as is touching the ropes or the chariots themselves. 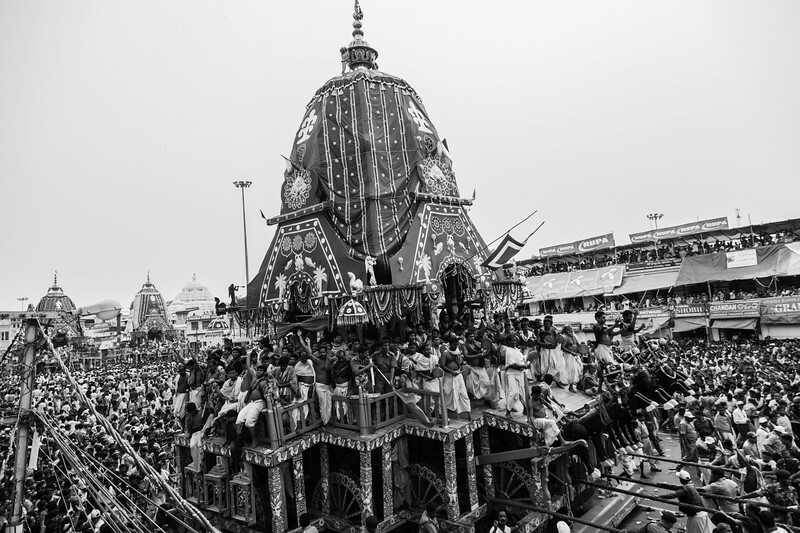 The festival can be extremely dangerous because of the size of these vehicles and the vastness of the crowd lining the route. 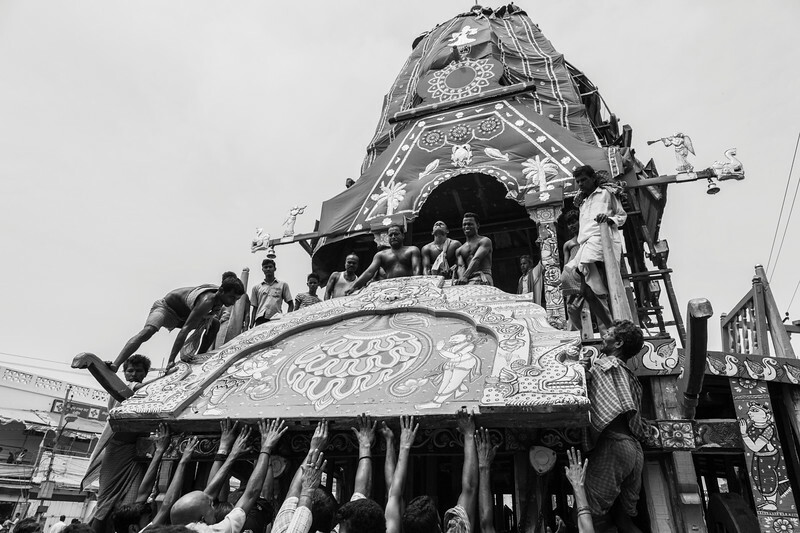 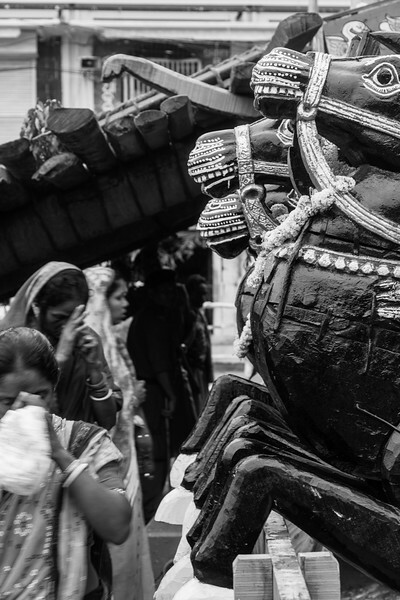 In the past devotees are believed to have willingly thrown themselves under the chariots and even today, the frail and elderly put themselves at some risk, as they surge through the crowds to be close to these revered vehicles. 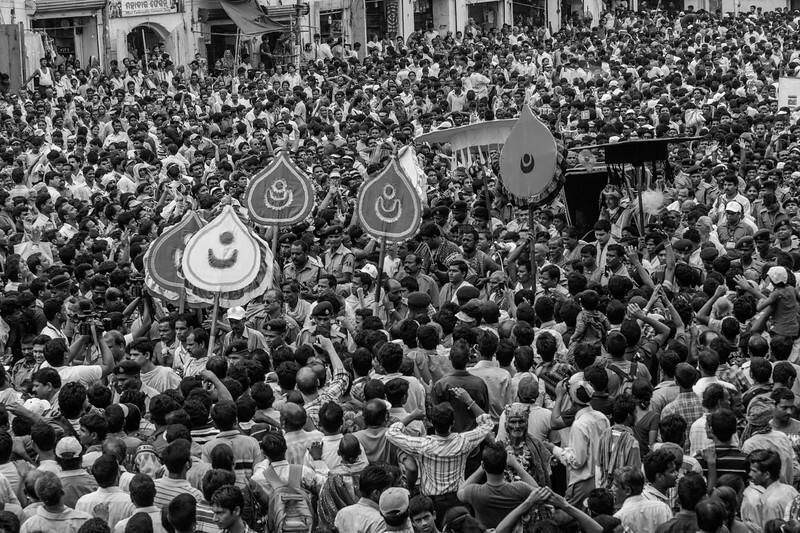 These photographs were taken on the Rath Yatra in July 2011.